We can all breathe, America. The Presidential Debates are finally over. 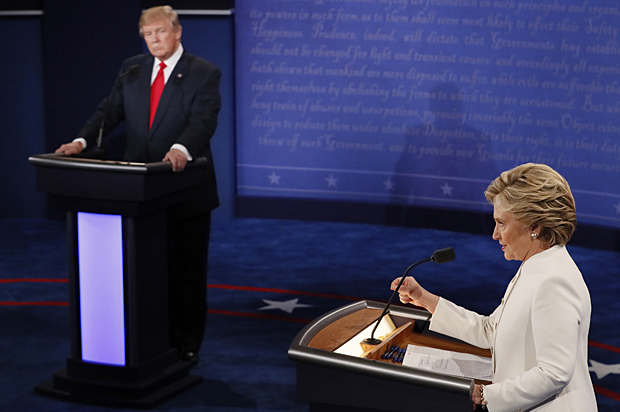 Donald Trump and Hillary Clinton battled it out one last time on October 19, and there weren’t many surprises. Aside from some variations in questioning and the strong moderating by Chris Wallace, this debate was extremely similar to the first two. The 2016 debates have become must watch TV, as the tumultuous relationship between Clinton and Trump is wildly entertaining, but also unfortunate. In fact, I’m sure Saturday Night Live was once again taking vigorous notes for new comedic material. Aside from Trump’s tweets about his victory, Clinton certainly showed herself to be superior in this final debate. However, Trump walked into the debate again with the American public’s extremely low expectations, and that can sometimes make the appearance of his performance seem better than its reality. I hope that American voters can look past this and understand that Hillary Clinton is the only candidate that showed the preparedness and fitness to be the president of the United States. Many viewers, including myself, made some jokes that moderator Chris Wallace was the winner of the debate. However, jokes aside, he did do a great job keeping the two candidates in check. He was fair and made them answer questions directly. Also, he brought up two topics that weren’t really touched on before: abortion and guns. Trump really appealed to the right-wing, Christian, and pro-life crowd by emphasizing the horror of aborting a “nine month old fetus.” I hope Americans were able to see past his attempt to trigger an emotional response, because that scenario just isn’t realistic. It was just one of the many ways Donald continues to discredit himself. He completely overlooked the severe health issues a pregnant mother can face at any phase of the pregnancy. To my dismay, Donald Trump continued to attack Hillary Clinton for her wish to reform the Second Amendment. She made it clear that she is not anti-gun, but wants to implement more thorough background checks and regulations to keep Americans and children safe. Trump boasted how terrible this would be, and reminded everyone how he’s supported by the NRA. I’m sorry Donald, but gun violence is at an all time high in America. We need to make some changes and make an effort to look at who’s buying these weapons. His plan to “make America safe again” just doesn’t make sense. Hillary Clinton has shown herself to be educated, prepared, and capable of handling foreign policy, industry, and social issues in America. While Trump has shown himself to be stubborn and dangerous. Hillary has a big lead, but a rise in Trump support would no longer surprise me as this election continues to defy everything I thought I knew about politics. The good news is, there’s only two weeks left of this madness.